Forrester’s Clement Teo writes that companies such as Meat Pack and Nivea have cracked the mobile code by using beacons and apps to deliver utility. Now it’s your turn. That thought flashed through my mind after attending a recent briefing on beacon technology by the Location Based Marketing Association in Singapore. At the briefing, Meat Pack, a trendy shoe store in Guatemala, was used as an example of how in-mall beacon technology can be used to ‘hijack’ customers heading to rival stores. Using GPS tracking technology, Meat Pack enhanced its app to identify its sneaker fans entering the official store of one of the brands sold at Meat Pack. When this happened, the app triggered a special notice with a promotion that provided the sneaker fan user with the chance to earn a discount, starting at 99 percent off and decreasing by one percent every second. Users had to hurry towards the Meat Pack store to make the countdown stop. As a result, over 600 customers were ‘hijacked’ from competing shoe stores and, each time a discount was redeemed, the user’s Facebook status was automatically updated, creating a viral effect with each ‘hijacked’ connection. A more interesting use of beacons is as child locators on the beaches of Brazil. Sunscreen maker Nivea cleverly used beacons embedded in paper wristbands in tear-away pages in a consumer magazine. The beacons allowed parents to track (up to a distance of 200 metres) where their kids went on Brazil’s crowded beaches via a mobile app downloaded to their smartphone. Not only was this a much welcomed child tracker, the app could also remind parents to slap more sunscreen on their kids every half an hour. These two examples demonstrate that mobile is not like any other medium we’ve seen before. The smartphone owner checks her device dozens or hundreds of times per day. It’s a simple case of conditioned response. First, you put your email on your phone. Then you check it when you have a spare moment. Then you ask the phone for the weather. You check your scheduled appointments. You get lost, and use the map to get back on track. At the end of a meeting, you snap a photo of the diagram someone has drawn on the whiteboard. Need a taxi? Book one with a mobile app. And so on and so forth, until, like one of Pavlov’s dogs, you become conditioned. This is what we call the ‘mobile mind shift’: the expectation that any desired information or service is available on any appropriate device, in context, at your moment of need. People are making the shift. And if your company is not visible in this environment, you become irrelevant. Forrester Research measures this phenomenon, and our survey shows that the number of connected devices, frequency of access and diversity of locations of any given individual can predict the rest of the mobile behaviours, allowing us to place each person on a scale called the ‘Mobile Mind Shift Index’. Scores above 40 indicate that the individual has ‘shifted’, meaning they’ve changed their behaviour to become permanently dependent upon the phone. 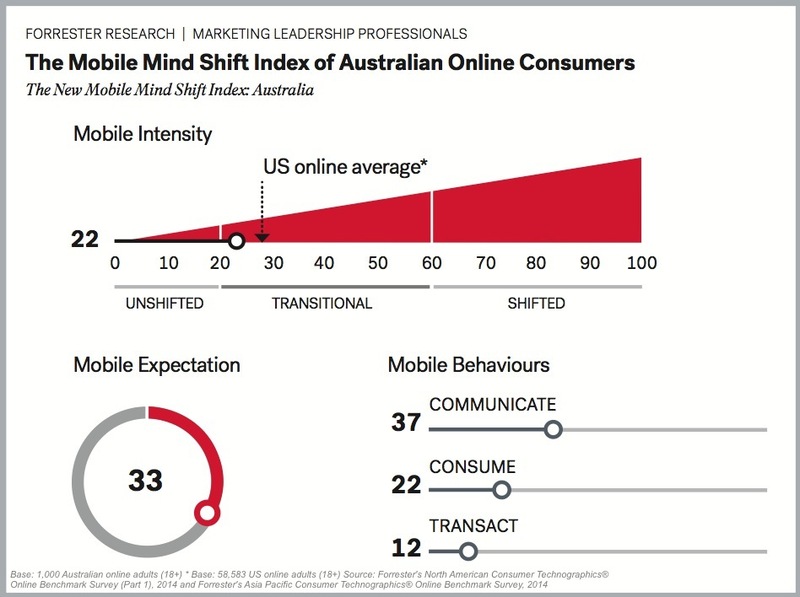 Australian online adults scored 22 on the Mobile Mind Shift Index, which is low in general and significantly lower than their peers in the US, metro China, metro India and Indonesia – despite the fact that three-quarters of Australian online adults have a smartphone. So we’re still at the start of this shift, but our surveys clearly show movement, with Asian consumers in the lead, North Americans on the move and Europeans rapidly gaining. The mobile mind shift is underway, and it’s global. The obvious response – advertise on mobile – tends to fail. Mobile advertising is interruptive. Smartphone owners are in search of instant gratification and they are very, very impatient. The smartphone has trained them that answers are available in a few moments. The lack of screen real estate, and little tolerance for advertising, means that marketers must pursue a different tack. Mobile customers seek utility. Your job is to deliver it. You must shorten the distance between what the customer wants and what they get. Deliver on this promise and you create relevance. Don’t, and your customers will go elsewhere to get it. Companies like Meat Pack and Nivea have cracked the mobile code, delivering utility through beacons. Solve your customer’s problem – whether it’s keeping tabs on little ones on the beach or getting a huge discount on the next pair of sneakers – and they will want to connect with you. Clement Teo is senior analyst at Forrester Research. Forrester is a Marketing content partner – non-commercial collaborations with leading organisations to provide content for the magazine (like this article) as well as exclusive benefits for Marketing Advantage Members. Visit marketingmag.com.au/advantage to join.